Speaking of Edmond Hamilton, the above cover sees his most famous character painted by Frank Frazetta, the premiere fantasy artist of the 1960s. 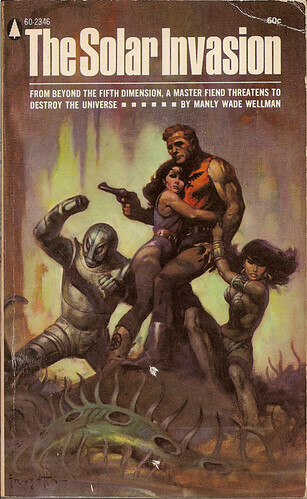 Frazetta casts such a huge shadow over paperback cover art that his influence can still be spotted on scores of covers on modern books even today. Spend a half hour looking at the covers in the science-fiction and fantasy section of your local Barnes & Noble and you’ll find at least a dozen covers that ape his style. If not for Frazetta, Conan the Barbarian wouldn’t have half the reputation and popularity he has today. Here we see Frazetta illustrating Hamilton’s Captain Future, a science inventor superhero from the Pulp Era who was the only science fiction character to get the title of his own series. The racks of the early 1940s were full of Spiders and Shadows, but only Captain Future represented the sci-fi side of things. Captain Future is generally thought of as a low point in Hamilton’s pulp career (he later moved to comics where, among other things, he created a Captain Future-based space hero named Chris KL-99). The magazine was aimed at a younger audience than most of the science fiction fare of the day, and they are a bit juvenile and jokey. But they’re also damn fun. The good Captain travels the solar system with a hyper-intelligent floating brain with electronic eyes, a wise-cracking flexible-skinned android and his rival but but emotionally needful steam-shovel-faced robot. Each installment of Captain Future included a short write-up of the planet on which the adventure took place, which generally mirrored the quasi-shared-world solar system used by early pulpsters. The few issues of Captain Future I have are among my most prized pulps.